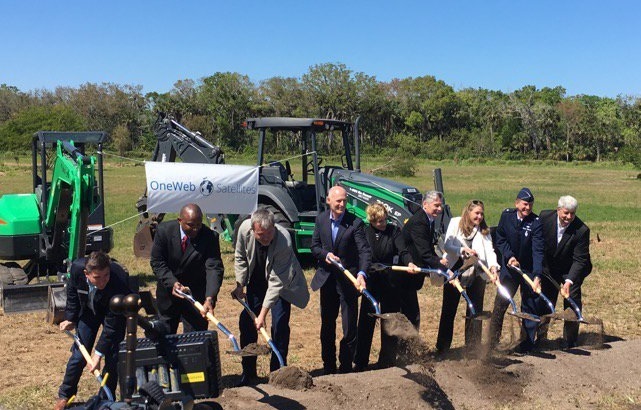 MERRITT ISLAND, Florida - OneWeb held a ground-breaking ceremony on Thursday to mark the beginning of construction on its 100,000 square foot satellite manufacturing facility on Florida’s Space Coast at Exploration Park, just south of Kennedy Space Center. OneWeb Satellites is a joint venture between OneWeb, a satellite-based internet provider, and Airbus, the world’s second largest space company, with its first order to include the production of 900 communications satellites for OneWeb’s low Earth orbit constellation. Once the satellites are in orbit, OneWeb's ground terminals will act as small cells with the ability to provide access to a surrounding local area via a WiFi, LTE, 3G or 2G connection. During the ceremony with Florida Governor Rick Scott, OneWeb Satellites CEO Brian Holz and Airbus Defense and Space Inc., President Mike Cosentino, announced that the factory is set to begin its full series, autonomous assembly line production, integration and satellite testing later in 2017. The $85 million high-volume satellite factory is anticipated to create nearly 250 direct, highly skilled manufacturing and engineering jobs in Brevard County, Florida. The first 900 production satellites will weigh only 150 kg and are expected to have better performance than much larger, more costly communications satellites today. The satellites will be used primarily by OneWeb for its global internet services, but the new low-cost, ultra-high performance satellites will be available for other commercial satellite operators and government customers globally as early as 2018. The satellites are designed with modularity for multiple mission configurations. The factory will include state-of-the-art automation, test equipment, and data acquisition capabilities to shorten assembly times and provide a means to analyze factory performance and process improvements. The company stated in a release that up to three satellites per day can be produced at the new factory on short schedules, at significant cost savings and without affecting the high levels of quality and technology. Local contractors in Florida will support the project, and additional capability is expected to move into the region. This will be the first satellite manufacturing facility in Florida and the first in the U.S. located in close proximity to a launch site.